The notion of “it’s apples and oranges” always seemed a bit odd to me. The phrase is meant to counter an argument by positing the comparison is between two different things altogether. So, why not say, “It’s apples and pianos”? Those are two objects that would never be considered for their “sameness.” Well, I recently found my “apples and oranges” when I went to several meat-centric outings for Daniel Delaney and his BBQ brisket. Launched in early spring, Dan’s venture was simplistic if nearly impossible (apples and pianos): Make the best damn brisket NYC has ever tasted. 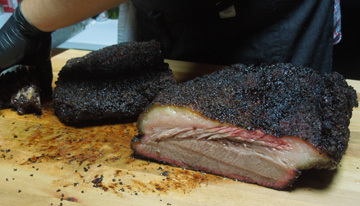 He hauled a smoker up from Texas, but rather than open a storefront (with tons of overhead), he presold the meat (selling out in two days) for a series of pop-up eating experiments called “Brisketlab.” Lucky patrons could buy pounds of meat and sign up for events in 1/2 pound increments. I bought three pounds, and signed up for four events. The evolution of Dan’s business—not to mention the brisket—has been very much a process of apples and oranges: It’s all meat, but some of it is presented better or tastes better. I was also fortunate (through no great planning of my own) to choose three very different outings for my brisket (outing #4 I’ll be attending in a couple of weeks). The first is what I’d call the “Backyard BBQ with Beer” event; the second, “Oenological High-End Hipster Brisket” event; the third, “Manhattan Hijinks with Booze… oh, and there’s some meat over there” event. The interesting interior of Domestic Construction. 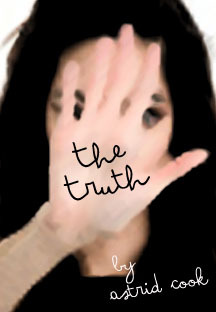 Date/Time: 1 July 2012; 12 p.m. The Scene: Domestic Construction looks like a converted mechanic shop as taken over by your great aunt Matilda who’s a combination crafter-hoarder. A two-woman interior (and sometimes exterior) design enterprise, Domestic Construction was a quirky choice for a pop-up, with ample grounds for a side station, Sixpoint beer distribution, and band stage. The Low Down: This was Dan’s second day on the job, so to speak, having held his very first Brisketlab the day before at Gizmodo Rooftop in Soho. It was also the Eurocup final between Italy and Spain. The check-in went pretty well: We gave our ID, got a handstamp noting 21+ for beer, and a nicely designed “wooden nickel” for each 1/2 pound of brisket (I chose a full pound, and had brought along a takeaway container to bring some home). The water was free, which was a good thing because it was easily in the low-hundreds out in the yard. The tin box of Domestic Construction was not much cooler, but it did offer some shade (not to mention colorful distraction while waiting for the meat to be cut). The bluegrass band, Tumbling Bones, was setting up on the stage, but it took at least a half-hour (and I didn’t arrive particularly early) for Sixpoint to have its offerings iced down. Finally, Dan gave a little “thank you spiel” and joined sidekick Hunter to carve the brisket and serve up sides, respectively. 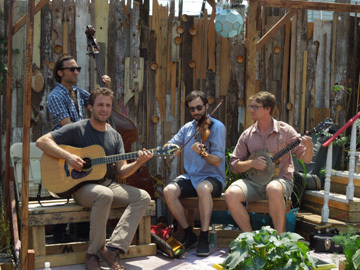 The band played on… until their instruments began to melt in the 100-degree sun. Because I’m rather impatient by my nature (not quite accurate—apples and oranges, possibly?—I don’t like to waste my time standing in line), I had already scoped out a spot near the very front of the line. Good thing, too, because a hour in, many people had done nothing but wait on that line in that heat, bemoaning the fact they were hot, hungry, and gonna be late for the Euro final. Dan offered “lean or fatty,” and since I had a full pound (two tokens), I chose half and half. I found a bench in the full-sunshine and listened to the band until they had to give up the stage because their string bass was melting. A few Italy fans joined me, bought me a couple rounds of Sixpoint, and said they were going to a sports bar as soon as they got their brisket. The Booze: Variety of Sixpoint Nanokegs. At $2 per nano, the beer was a steal, but it was too easy to drink too much in that heat. The Sides: What appeared to be store-bought (and soggy) pickles and Costco-level-amounts of bland white bread. A bit of fresh-cut (probably non-organic) white onion to toss on top. Meh. What saved the day side-wise, however, was Mean Frites and their delicious sauces. They get an A+ for frying out in the yard with minimal shade. Plus, their fries were really good and included in the price. Extra Cash Laid Out: $6, for one nano, $5 tip for the band (recommended), and $1 tip for the fries. Overall Grade: C+ for long waits, inconsistent sides, not moist lean brisket, and poor thinking on dealing with the heat in a venue that offered little to no respite; thank goodness for the free water and the quick dash to watch soccer in an air-conditioned bar, or someone might’ve needed an ambulance. 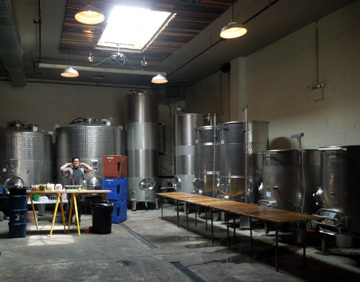 Date/Time: 15 July 2012; 12 p.m.
Dan sets up amongst the vats of Brooklyn Winery. The Scene: Brooklyn Winery sits on North 8th Street a block and a half east of Bedford Avenue. I knew it was there, but not once had I gone in. The imposing façade belies a sparkling nouveau interior complete with vats and a wine tasting room. 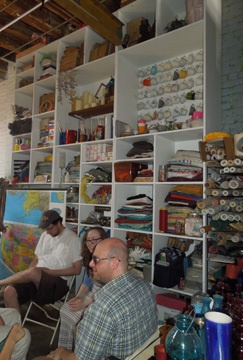 The front entry is spacious and leads into the back vat room; here was where a beverage table was set up. The secondary room held the wine bar and a Brooklyn Winery waitress was offering table service to those who wanted to have wine by the bottle, glass or in flights. The Low Down: What a difference a fortnight makes! Talk about your apples and oranges! I hand it to Dan for seeking (and obviously taking) feedback from those first few events. The check-in at Brooklyn Winery now includes a color-coded handstamp. Instead of waiting an hour in line for brisket, groups will be called up by color. This is a great way to deal with the queue, simply because most people are fine with waiting—especially in a venue as fine as this—so long as they aren’t standing there waiting without a drink in their hands. With Brooklyn Oenology around the corner, I make a mental note to do a Williamsburg wine tour the next time my mother comes to town. And the wine is quite good. And quite expensive. The “deal” is $8 for a small pour (probably 8 oz.). They are also selling Brooklyn bottle brews for more than I wanted to pay ($5-$7, if memory serves). Most people are drinking wine, and some of the patrons are obviously not Brisketeers. The air-conditioned comfort of the space yields few complaints about the wait for brisket. However, I hedge my bets by being close to the table when Dan thanks us, explains the raffle (if you donate $10 to the band, you’ll be entered into a raffle for a full brisket; I gave my customary $5), and then asks the first group to get in line. I am the second person to get meat, so I wander over into the tasting room with what is left of my $8 pinot noir and a large bottle of help-yourself water. Which brings me to a point of contention over the paper towels. Dan’s team has an industrial roll set out and you can tear as much or as little as you like from it. It was awkward at the last venue, where tables were few, so I was juggling a can of beer and my brisket while trying to rip off a bit of toweling. Would it be too much to cut it into pieces? It’s not a public toilet, and the brown wrapper roll in the middle of this fine winery is completely incongruous. If I had one complaint, it was that the band (Baby Soda) was too loud for the space. They were stationed in the middle of the front room, and from the wine tasting room, I could still hear them just fine. Whether because of the venue or that Dan had been tweaking his brisket recipe (he said it was mostly reducing the amount of salt in the brine), this was Brisketlab as I’d hoped it would be. And while I don’t consider myself at home in “hipster” Williamsburg, I loved Brooklyn Winery and was happy to have such a great reason to try it out. The Booze: All the wine that you could drink (or afford to drink); I walked in with $16 in my wallet, but the tasting room side with table service took plastic. Debit card holders beware. Oh, and they had super over-priced Brooklyn Brewery beer from the next block. The Sides: More of the terrible pickles and processed pulp “bread.” I take the onions and some nice slaw that might have been homemade. The Meat: The brisket was much better, or at least it seemed to be. I had brought another takeaway container, and I chose half-and-half again between fatty and lean. The lean was far moister than what I had eaten two weeks prior. Extra Cash Laid Out: $13, for one glass of wine and a $5 tip for the band. What I laid out in credit was three figures, including a wine flight, tip, and a bottle I decided to take home with me. Overall Grade: A– for some confusion as to when the second set of color-coded folks should queue up and over-priced beverages; good wine aside, there should have been a $5 wine option and Brooklyn bottles at $5+/pop (I honestly don’t remember if it was more than that, but I know it wasn’t less) is crazy, particularly when you consider the $2 nanos at Domestic Construction. Date/Time: 3 August 2012; 7 p.m. The Scene: Slate, one of those bars that makes me think I need to buy a better pair of shoes. The noise level comes in at three volumes: loud, louder, and loudest. The doorman was nice. A barrage of the senses and no clear indication of where to queue up to get in because of the large Friday night Slate crowd (The Scotch Club apparently inhabits the side room; a long space with a full bar, less-than-adequate seating, and a few pool tables). Pretty sure I jumped the queue, but I didn’t mean to. Ended up in the first set of hand-stamps. The Low Down: Okay, full disclosure. This was so not my scene. I wouldn’t go back to this place if they were giving away the drinks. It has that “moneyed” fi-di-meets-fashion-district vibe to it. If I want upscale, I can go back to the wine bar, and I had just finished a bartending shift at a craft beer bar, so the fairly laid back clientele there did not prepare me for the whiplash of “coolness” (and I use that term ironically) of this club. I guess I had in my head—oh, I don’t know—A SCOTCH CLUB! I had envisioned overstuffed chairs and a cigar room, interesting bottles of single malt that I probably couldn’t afford but would have sprung for until my shift-tip funds ran dry. Instead what we had were run of the mill well drinks, bad beer, and a few specialty spirit concoctions put together by Woodford Reserve. Since I’m all about the “new and different,” I went for their specialty cocktail. The small serving was pricey, but Tony Makayev (Woodford Reserve’s rep) was there trying to make sure the mix was right. Needless to say, I managed to score several free rounds while figuring out the right mix of sour-sweet and bitters (we agreed that, while we both liked it tart, the audience in house would want additional sugars). Dan was also working the crowd, obviously a lot more confident than a month prior. 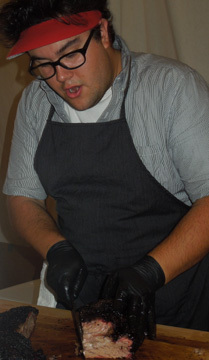 He had grown from backyard BBQ guy to a full-blown entrepreneurial chef. Between chatting with Dan and schmoozing with Tony, I wasn’t at the front when my color was called. That said, I had only a short wait to get my brisket and everyone seemed pleased with their surroundings (several patrons who were not in the first call were playing billiards; apparently there was a band, but the noise of the bar drowned out most polite conversation and any additional music). The mass-purchased flavorless sides were in house (I politely declined them, although I did take the slaw and even went up for seconds). The brisket was pretty much flawless at this point, and despite only collecting 1/2 pound, I had leftovers (newly minted with minted slaw). Dan’s assistant was kind enough to wrap up what I had in a doggie bag. I escaped as quickly as I could and headed back to Brooklyn. The Booze: Typical full-bar fare, ranging from well drinks to high-end pours. Some low level beer (like a bad dream, I’ve blocked it… pretty sure Heineken/Amstel was involved). 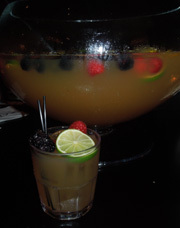 The best of the bunch: Deckel Lust, a sangria-like (lots of yummy fresh berries in it) amalgam of Woodford Reserve bourbon, Hella Bitters Citrus, grapefruit, lemon juice, Peyshauds bitters, and sparkling white wine. The Sides: More of the same. Dan is receptive to feedback and either got the memo or realized the sides don’t stand up to the meat. He’s partnering with Whole Foods to provide (what I hope to be superior) sides moving forward. The Meat: Just right, said Goldilocks, off to find a comfy bed in which to sleep. Extra Cash Laid Out: $16, for two cocktails, including tip. Overall Grade: B mostly for the venue but crap sides knocked a “+” off the grade. Overall, I’m impressed with Dan’s growth both as a businessman and as a chef. I will be sorry to see the end of Brisketlab. I’m guessing this summer will be all there is of this venture, as he moves on to bigger and better things. He’s already planning a pop-up store for the fall (brisket is still available for preorder if you hurry!). I’d be very surprised if by this time next year he doesn’t have his own Brisketrestaurant. Good news for carnivores in the city. 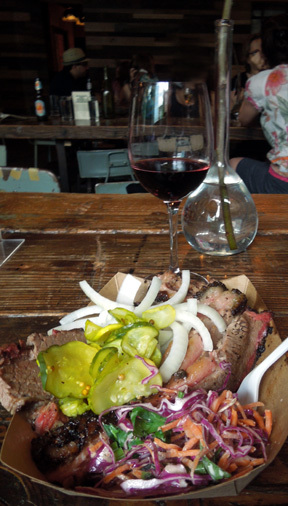 Tags: Brisket, Brooklyn Winery, Delaney BBQ, Sixpoint. Bookmark the permalink.